I am pretty happy with the Parallel port interface - it doesn't require any drivers and works just fine. For portable applications using my Netbook in the field, I have no choice but to use an USB interface. My Acer Netbook doesn't have PCMCIA slot (for Parallel card) or native parallel interface and the only option to control the VNA is USB. A standard, off-the-shelf USB to Parallel port converter (commonly sold for printer interfacing) won't work. These converters are designed for printers use only and they don't have 100% bi-directional parallel port support. Fortunately, Dave G8KBB designed a very nice interface based on the Cypress FX2 (EZ-USB) USB micro-controller (CY7C68013A). For my project I used a PCB from WB6DHW. His interface is a nearly identical clone (electrically) of the G8KBB interface. To be honest, I am less than impressed (other words, which I'll save come to my mind ) with the PCB layout done by WB6DHW - it looked like somebody was learning how to design a PCB and used this project as a practice board. I was almost ready to design my own board (G8KBB's board is excellent but his PCBs are not readily available). Don't mean to bash WB6DHW - just expressing an opinion. At the end of the day tho, I decided to close my eyes and got the bare board from WB6DHW because of its low price - fabricating my own board was going to cost a lot more and wasn't worth the effort/money just for a single piece. All components are from DigiKey, including the Cypress chip and the Hammond die-cast aluminum enclosure housing the interface. I had to modify (mill) the PCB in order to fit it in the enclosure. The PCB is raised on stand-offs since the Mini-B USB connector along with some other parts are placed on the bottom side. I prefer to have the much sturdier and more reliable USB-B connector but there wasn't an easy way to modify this board. The Cypress FX2 chip is in a package with fine pitch leads but it wasn't that difficult to solder it pin-by-pin under sufficient magnification. There was no need to install any of the other connectors - I just soldered the wires directly to the board. The enclosure is a tight fit and if I had the connectors installed it would have been difficult to manage the wires inside. The most time-consuming part in this project is wiring the board to the cable and the female DB25 connector according to the schematics and the table provided by Dave G8KBB. This is the complete interface. It is rugged yet compact - the only delicate part to worry about is the Mini-B connector. The initial setup is a bit complicated - a Vendor ID and Product ID must be written in the EEPROM in order for the USB micro-controller to properly report the interface in Windows. To accomplish this task, a step-by-step procedure and a piece of configuration software are published on Dave's, G8KBB web site. First, special drivers are installed in Windows to get access to the Cypress FX2 chip and the EEPROM address space. Then, using "USB Configure" (by G8KBB), the appropriate IDs are programmed in the EEPROM according to the hardware in use - version of the interface/VNA and current demand (in case the USB port is used also to power the VNA). This setup is one time deal - afterwards the interface is used with its regular USB drivers. I've completed the PCB for the RF-IV sensor. Now I have to come up with an enclosure. In addition, I have to install a mini-DIN connector on the VNA's rear panel with power and control signal for the RF-IV sensor. The PCB is very simple and easy to work with. A thing to note is the slightly awkward placement of the RF connectors - it is needed to achieve certain level of port-to-port isolation. There are two transformers, one (on the left) takes the Current sample, the other (on the right) the Voltage sample - this part of the circuit is almost the same as in Larry's N8LP coupler for the LP-100. The DUT is connected to the RF DDS of the VNA thru the current transformer. The RF switches (Peregrine PE4220 ) are controlled by the software and switch the signal path of the samples to the RF DET input of the VNA. While the VNA takes a sample of the current (I), the voltage (V) transformer is terminated with 50 ohm load and vice versa. There is an on-board 3.3V voltage regulator supplying power to the RF IC switches. Only one detector is used in the VNA in this configuration which improves the stability and accuracy of the measurements as both -the I and the V samples are measured by the same detector alternatively at a high frequency. The control signal to switch between the samples is generated by the software and in this case is just looped thru the VNA. Winding and installing the transformers is a bit tricky because of their construction and small size. One of the winding is done with very fine (AWG #36) wire. In addition, the current transformer (shown on the picture) has a grounded electrostatic shield between the primary and the secondary. Both transformers are attached to the board with tin-plated brass strips bent into U-shape. The strips provide RF screening and stress-relief at the same time. I posted a number of plots of my SteppIR BigIR Mrk III /w 80m coil on my antenna site. All plots were generated with the myVNA software. Calibration of the VNA was performed at the far end of the 100ft feedline to tune-out the transformation effects of the transmission line. The scan was done while the antenna was tuned for minimum SWR on the 20m band. N2PK VNA - It is a "Lab in a Box"! I love my new toy! It is so nice to be able to perform all kinds of measurements and tests without begging "that guy with the HP VNA" and be left at his mercy (and free time). I tested a transmitter low-pass filter (C-511-T by Bell Industries) which claims 80db attenuation at 54 Mhz on its label. As one can see - attenuation is only 63 dB at 54 Mhz with maximum attenuation of 66.5 dB at 57 MHz - that is pretty far from the claimed "80 dB". This screen-grab shows the true beauty of the Dual Detector setup - for example being able to plot the VSWR curve in reflection mode at the same time as the attenuation curve in transmission mode. Its not only a VNA - it is a handy signal generator - myVNA software allows you to use it as adjustable signal generator. This picture shows a rough frequency measurement (my scope has current calibration), 14 Mhz - same as the value set in the software. (the oscilloscope of course can't measure with such great resolution as what the software allows you to adjust but gives an idea about the clean sine wavefrom generated by the DDS). Among other things - there is a vector volt-meter available in myVNA. This image shows the result of -10 dBm output measured thru a variable precision attenuator (set to 8dB) at 6 MHz : -18.0026 dBm. I'd say pretty accurate! The vector voltmeter can use both ADC at the same time for measurements and display the phase difference as well. 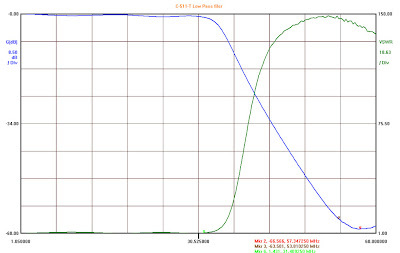 Plot of the Return Loss of my LMR-600 coaxial feedline going to the SteppIR vertical. The length of the cable is exactly 100 ft (+/- 1 ft). The graph shows a Return Loss of approx. 1.2 dB @ 50 MHz. The actual loss is one half of the measured RL (just one way) or 0.6 dB @ 50 MHz. Times Microwave specs for LMR-600 are listed as 0.5 dB @ 50 MHz per 100 ft. A 0.1 dB difference is insignificant (I have connectors on both ends and I used a BNC-to-N adapter for the measurement). The cable is under ground in a PVC conduit (hopefully watertight) but I can keep an eye on the losses with the VNA. Here is another interesting plot. 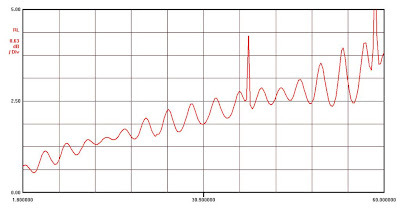 This graph shows the Return Loss of my entire station - from the transceiver antenna connector to the antenna feed-point connector 100 ft away. The signal path includes a RF patch bay, 2 coaxial switches, 2 directional couplers, gas-discharge lightning arrester, ACOM 1000 amplifier, common-mode choke, well over 100 ft of coaxial cable (in transmission line and jumpers) as well as a large amount of UHF and N connectors. The loss is approx 1.9 dB on 6 meters (again RL/2) and between 0.3 dB and 1.25 dB on the HF bands. Not bad at all, keeping in mind what is on the signal's path! 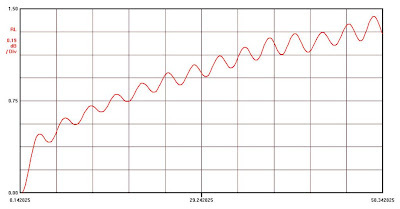 The two distinctive "peaks" on the graph are caused by the ACOM 1000 amplifier. These peaks represent the self-resonance of a built-in choke in the amp. The good news is that they are located outside of the amateur bands. ... and I am just scratching the surface of this great instrument! Proper calibration is absolutely essential for high accuracy measurements. Here are some notes on the calibration standards for the N2PK VNA. Initially, I've made my own Open-Short-Load-Thru kit. 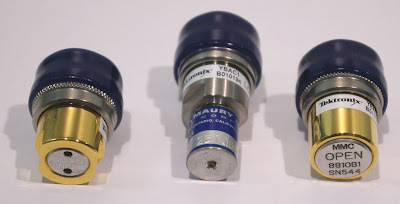 My VNA is equipped with BNC connectors so I used "clamp type" male BNC connectors for large diameter coaxial cable (such as LMR400/RG-8) to house my calibration standards. I also wanted to have some reference calibration standard to compare against. 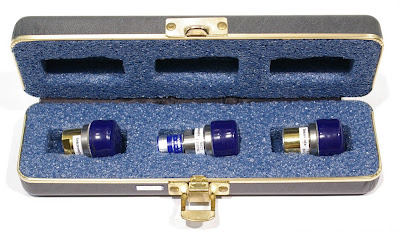 I was able to acquire (tnx to eBay) a precision commercial VNA calibration kit at very reasonable price. I did some comparison between my home-brewed calibration standards and the Maury Microwave VNA Kit (MMC) - good for VNA calibration DC to 18GHz. I wanted all of my cal standards to use the same type of housing in order to easily maintain the same reference plane. Looking at the commercial standards - that's not case - the shells are different size but the reference plane inside must be the same. As expected - the home-brewed Open and Short standards (which are fairly easy to fabricate), when compared to the expensive commercial standards seem to be pretty close. The Short standard must have low inductance and the Open - low capacitance. Looking at the MMC Short standard - it seems to be made out of one piece of metal for the center pin and the ground shell - the electrical short occurs at the far end of the center pin right at the back-face of the actual connector and the pin's length seems to be shorter than the normal N-connector center pin. The commercial MMC Open load has longer center pin attached to a dielectric disc in the back of the housing, but maintains the same "reference plane". The story is much different for the 50 Ohm Load standard. I made two different Load standards using different components (bulk-metal foil resistor and edge-trimmed precision thin film resistor - both rated for high frequency use and optimized for minimal self-reactance) and different construction techniques. Both Loads turned out to be not as good as the MMC Load (which I kind of expected) but the Load with the expensive bulk-metal foil resistor seems to be worst than the thin-film one. I suspect the difference is due to the construction and the much larger SMD component. In addition, I tested the combination of a Male BNC-to-female SMA adapter + home-brewed SMA Load (housed in RA male SMA connector shell, /w edge-trimmed thin-film resistor) was much closer to the commercial MMC Load and actually quite acceptable. I'll be trying yet different construction technique for the BNC Load standard. The main challenge with the BNC Loads is the installation of the SMD resistor. The center pin of the BNC is not captive and it needs to be fixed somehow in order to remove any mechanical stress form the resistor. So far I have not used any glue or epoxy in my cal standard constructions but I think it is about time to try it. November Update: This is my latest (and hopefully final) version of the BNC calibration standards. I was fortunate to find on eBay these "Male BNC / PCB mount connectors" - something you don't see every day! Looks like they are perfect for home-brewed calibration standards/test fixture. Good news is that the center pin is fixed in place, it doesn't rotate and it is not as long as the one in the "clamp-type coax connector"! Here is the 50 Ohm LOAD standard using a Vishay FC series, high frequency precision (0.1%) 0603 SMD resistor - Digikey p/n FC0603-50BWCT. This size resistor is a perfect fit between the barrel and the center pin. The center pin of the connector is trimmed down and the resistor is soldered in place. The other two standards - OPEN and SHORT were very easy to make! One should be careful when soldering the SHORT standard not to melt the center insulator with excessive heat (I used a water bath during soldering). On the OPEN standard the center pin must be trimmed down to keep the reference plane the same across all 3 standards. In order to create RF shielding, provide mechanical protection and facilitate easier handling, I prepared 3 short pieces (~1 cm length) of brass tubing (Stock #137, K&S Engineering, 7/16" (11.1mm)) and soldered each piece on the inside to the 4 ground pins of the BNCs. Closed-cell foam was used create an end-cap for each barrel. The OPEN and LOAD standard were closed on the back with additional RF shield - tin-plated brass disc, soldered to the inside wall. Final touch - heat-shrink tubing provides color-coding and nice finish. This is my full set of (m) BNC calibration standards - in addition to the OSL and LLC standards, I made some extra loads (12.5, 25, 75, 100 and 200 ohms) to aid calibration of other instruments besides the VNA. 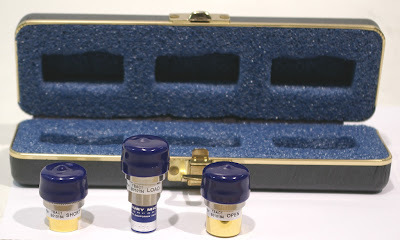 Update 2011: The excellent article by William Highton on standard definitions just confirms the fact that BNC connectors make poor calibration standards for ultra high frequencies (500 MHz and up). The home-brewed BNC standards are perfectly fine for the N2PK VNA with it's max 60 MHz frequency, but I would not use such DIY kit with commercial GHz VNAs. The standards described above are intended for use with N2PK VNA. Using the same construction method but using different connector - SMA or N type will yeld better accuracy with DG8SAQ VNWA.